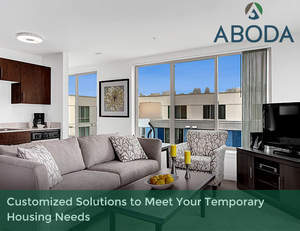 SEATTLE, WA--(Marketwired - Apr 21, 2015) - ABODA, a leader in providing global housing management for some of the world's best-known brands, announced today its ABODA Corporate Housing business line will now be known as ABODA Global Housing Management. ABODA has grown from a small family-owned company that was launched in 1988 to becoming the Seattle area's dominant provider of temporary housing for corporate relocating employees and interns, working with many of the top employers in the region. This move signals the implementation of its plan for global growth and corporate expansion. Dave Caple, CEO of ABODA, points to the company's recent growth as an indicator of what is to come. In the last five years, revenue growth overall for ABODA is up 125 percent, largely driven by corporate housing activity. "The number one reason major brands work with us is our Seattle-honed, service-first corporate culture, which makes engaging ABODA a highly personal experience," said Caple. "We are taking our service-first DNA and embedding it into our global growth efforts as we move from a dominant regional player that serves leading companies in a single area, to one of a few firms that offers an end-to-end housing solution for corporations in every industry, anywhere in the world they need temporary housing," he added. Lee Curtis, President of ABODA and the chief architect of its global business growth plans, says the name change from Corporate Housing to Global Housing Management is more of an "evolution than a revolution." "As businesses have evolved, so has ABODA," said Curtis. "This new name better reflects both our current capabilities and our focus for future growth. With expanded global capabilities, unique custom housing solutions and travel-related services, to name a few, we have built the most comprehensive housing supply chain in the industry," he added. Curtis explains that while ABODA plans to continue to increase its Puget Sound housing management services -- it maintains a proprietary inventory of over 2,000 units in the Seattle area -- it also has established a Global Client Services group that can offer companies access to another 40,000 housing units across the Americas, EMEA (Europe, Middle East, Africa) and APAC (Asia Pacific). Curtis explains, "Unlike other service or call centers in our industry that outsource their afterhours and weekend services and coverage, we staff our Global Client Service Center with ABODA people 24/7 so that we can guarantee the ABODA experience." "The growth opportunities for ABODA in key markets in the U.S. and globally are exceptional," Curtis said. "We have already created in the Seattle area a world-class delivery system for corporate housing that is the envy of the industry. Now we are poised to attract the attention of relocation decision makers, procurement managers, and human resource executives as they look for a company that can manage -- end-to-end -- and deliver a reliable and responsive housing solution for their mobility needs anywhere in the world," he added. "Our employees are our greatest asset," added Caple. "ABODA is owned by its employees so no one understands this better than we do. We simply take the worry out of the relocation or temporary housing logistics, and we believe what is working in Seattle will be highly valued not only around the nation, but in key global cities." ABODA is an innovative leader in global housing management services, providing end-to-end solutions to some of the biggest brands in the world, many headquartered in the Seattle area where the firm is based. ABODA Global Housing Management uses a logistics-focused approach, combining the best of program planning and administration, inventory management, execution, service delivery and technology to help corporate clients operate more efficiently and enhance customer experiences. Employee-owned ABODA is flexible enough to meet clients' ever-changing business needs through its award-winning customer service. Learn more about ABODA at www.aboda.com or call 1-888-389-0500.